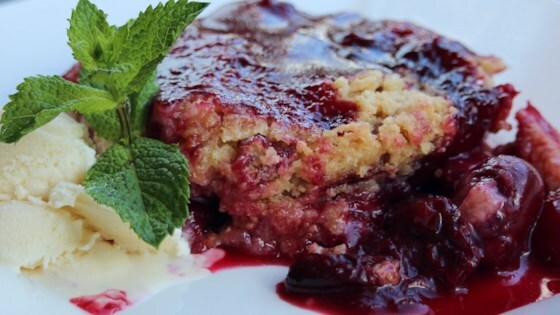 "Fresh cherries under a crumbly topping baked in an air fryer allow you to have a lovely baked treat during summer without heating up the kitchen with your regular oven. Serve with vanilla ice cream or fresh whipped cream. You will need an air fryer baking attachment or a nonstick baking dish that will fit into the fryer basket." Cube butter and place in freezer until firm, about 15 minutes. Preheat air fryer to 325 degrees F (165 degrees C). Combine pitted cherries, 2 tablespoons sugar, and lemon juice in a bowl; mix well. Pour cherry mixture into baking dish. Mix flour and 6 tablespoons of sugar in a bowl. Cut in butter using fingers until particles are pea-size. Distribute over cherries and press down lightly. Stir 2 tablespoons sugar, vanilla powder, nutmeg, and cinnamon together in a bowl. Dust sugar topping over the cherries and flour. Bake in the preheated air fryer. Check at 25 minutes; if not yet browned, continue cooking and checking at 5-minute intervals until slightly browned. Close drawer and turn off air fryer. Leave crumble inside for 10 minutes. Remove and allow to cool slightly, about 5 minutes. You will need an air fryer baking attachment or a nonstick baking dish that will fit into the fryer basket.